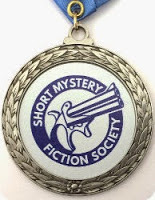 The Short Mystery Fiction Society unveiled the 2019 Derringer Awards shortlist on April 4. The results of membership voting will be posted May 1. This entry was posted in Awards and tagged Derringer Awards by Mike Glyer. Bookmark the permalink. One thing I learned from Teresa Nielsen Hayden: If you capitalize it, it’s “Deringer.” With two rs, it’s a generic word, but the name of the thing itself was spelt with one. I don’t think this is a case where millions of wrong uses change it. You’ll have to take that up with the Short Mystery Fiction Society. In the haste to display one’s erudition, one should not overlook that the award name would need to be capitalized because — it’s the name of the award. @Kip: You should wait until Thursday. We’re doing above-the-roll versus below-the-roll.